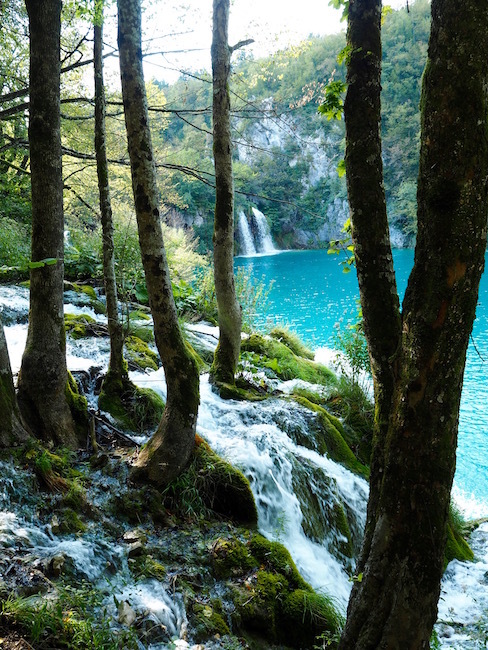 The Plitvice Lakes National Park is Croatia’s second most popular tourist destination after Dubrovnik. With over one million visitors every year, the park is a picture-perfect destination with a fairytale feel to it. 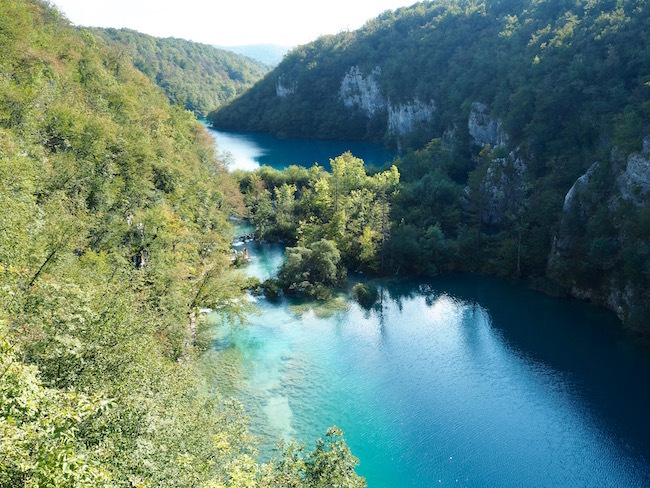 Located in central Croatia, it is roughly half way between Split and Zagreb (Croatia’s capital); about two and a half hours from Split or two hours from Zagreb. It is pretty easy to get to by public transport, day tours from either city; or by hiring a car and driving there yourself. 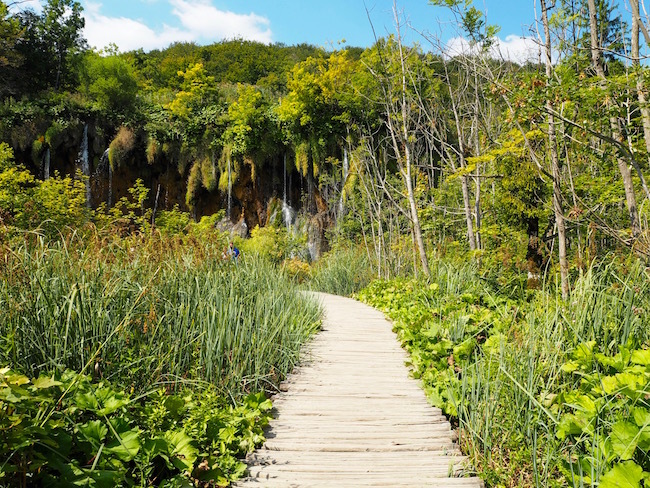 The Plitvice Lakes National Park is a UNESCO World Heritage Site, and it is easy to see why. 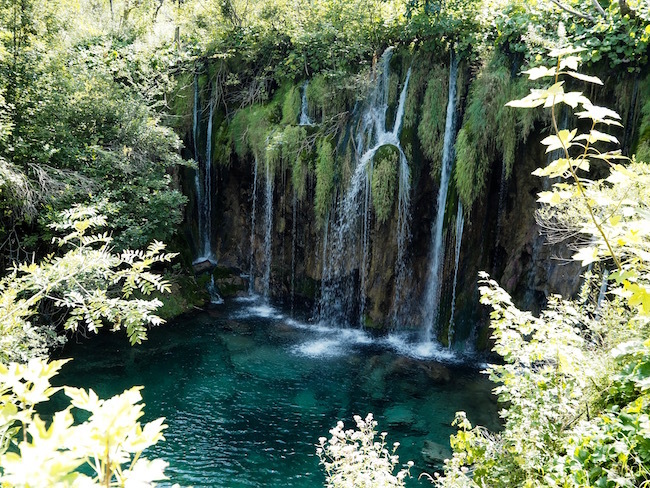 This natural wonder consists of sixteen interconnected and crystal clear lakes surrounded by over ninety waterfalls of varying sizes. 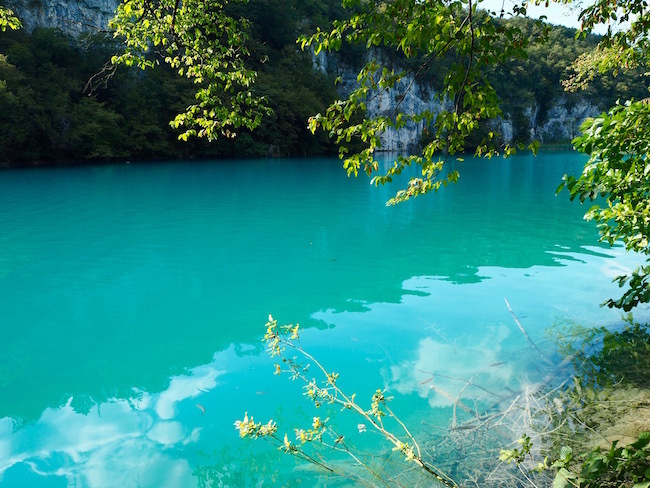 The colour of the lakes changes from emerald green through azure and then to aqua blue going from the higher parts to the lower. It is simply magical. 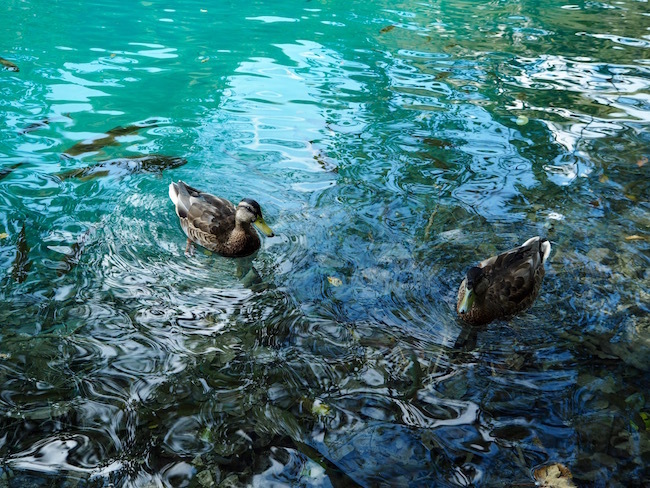 The water clarity is so clear that you can easily spot schools of fish swimming by the edges of the lakes (they are not scared of humans as they are protected from fishing). 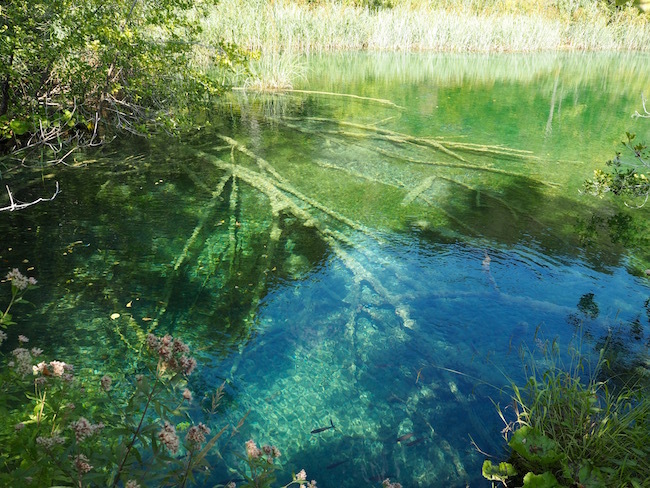 You can also see fallen branches lying at the bottom of the lake beneath a couple of metres of water. Surrounded by dense forests of beech, fir and spruce, walking in the park is so enjoyable that you will get a great day out no matter which season you visit in. The park is open yearly and is especially beautiful in autumn when the leaves change colour. 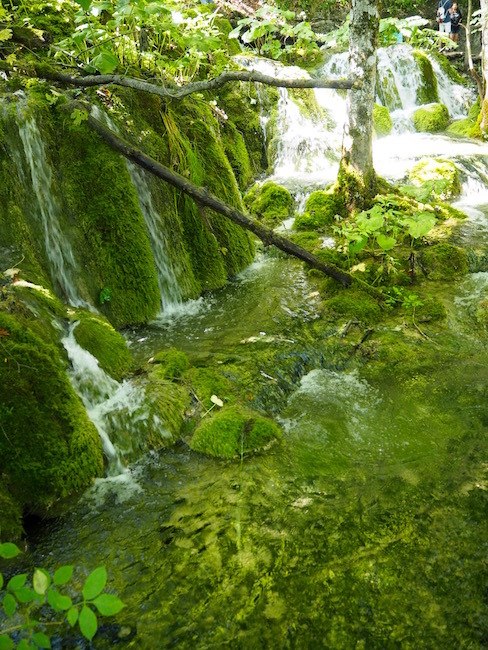 In spring when the water level is much higher from the melting of the winter snow you will find much wilder waterfalls and streams. Summer is, however, the highest season and can get extremely crowded. 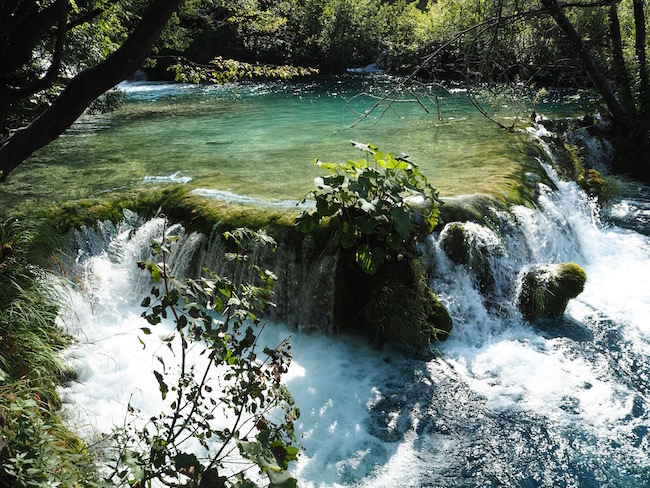 After seeing so many photos of this beautiful park we knew we couldn’t leave Croatia without paying it a visit. We booked a private day tour from Zagreb with an awesome tour guide called Vlatka and she made our day perfect. She knew a lot about the park and what to do, where to go and how to avoid the queues. Choosing a private tour was a great idea. With just the two of us it gave us the freedom to move at our own pace and to see much more of the park without having to worry about waiting for a bigger tour group. We visited right at the beginning of September at the end of the peak period. It wasn’t as crowded as it could have been but there was still enough people there that it was sometimes difficult to walk along the boardwalk, especially around the lower lakes. However from what we read, we were lucky; we were never stuck for more than a couple of minutes which is seldom the case during high season. Before arriving at the lake our guide Valtka stopped at Rastoke to let us have a coffee and photo break. 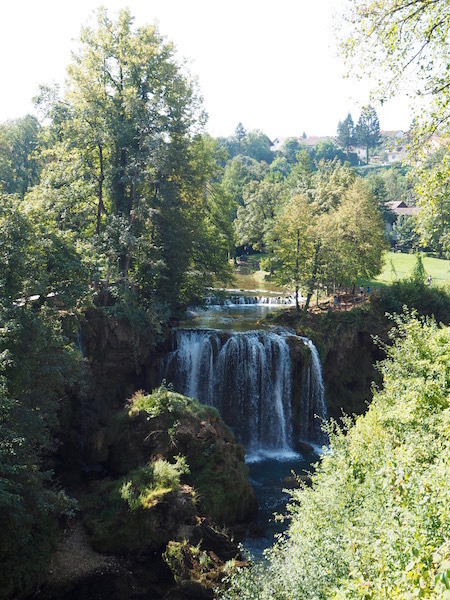 Rastoke is a small village at the junction of the Slunjčica and Korana rivers. 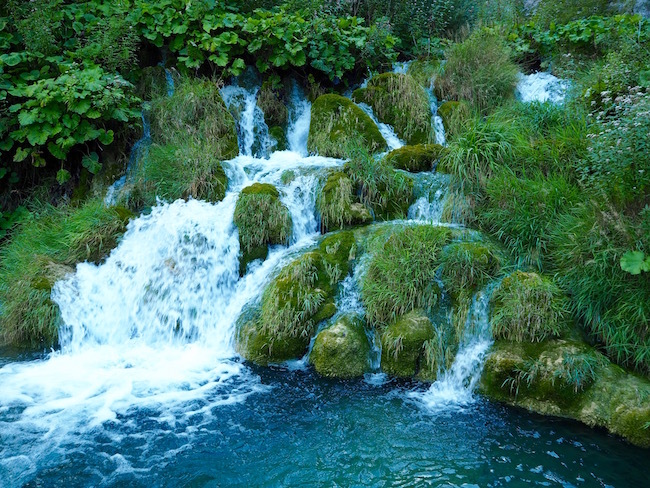 This charming little village has many streams and free flowing waterfalls. It is a great place to stop on your way to the lakes, for a short walk and to take photos of this beautiful area. 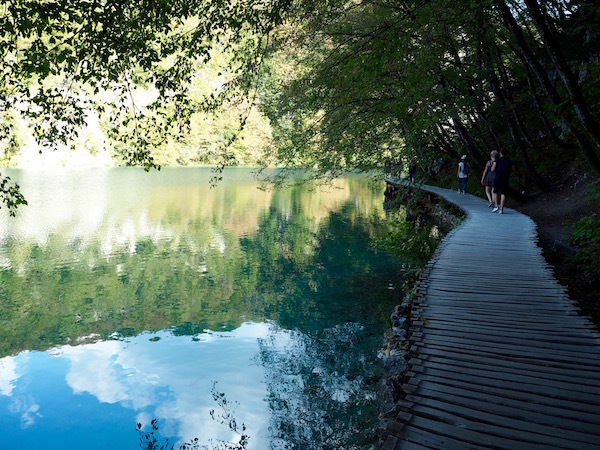 After another thirty minutes drive, we arrived at entrance two to the Plitvice Lakes National Park where we then parked. There are two entrances to the park and you choose an entrance based on the part of the park you wish to visit, or the hike you are planning on taking. 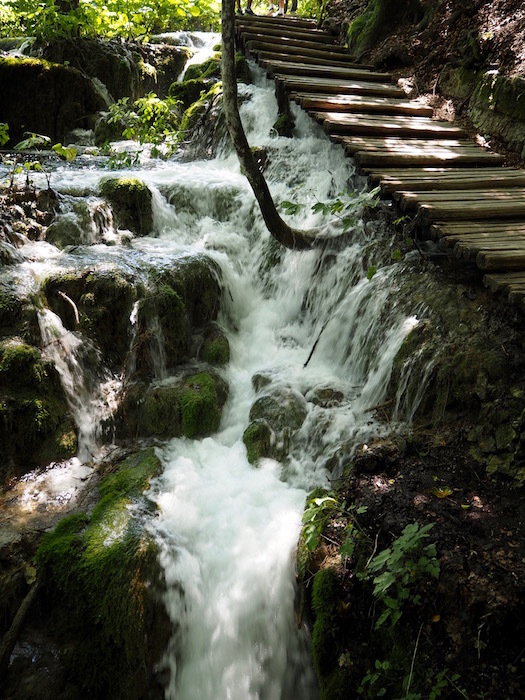 To identify the best-suited hike for you, check out the Plitvice Lake’s website. The sixteen lakes of the park are divided into two groups. 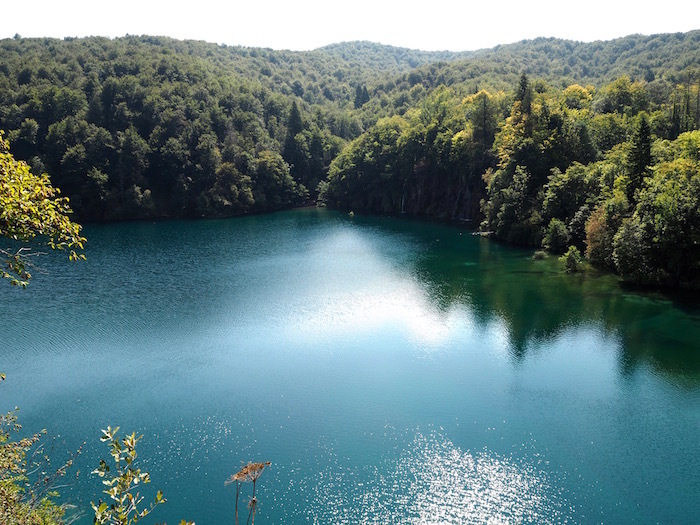 Twelve are part of the upper lakes or “Gornja Jezera” and four are part of the lower lakes or ”Donja Jezera”. 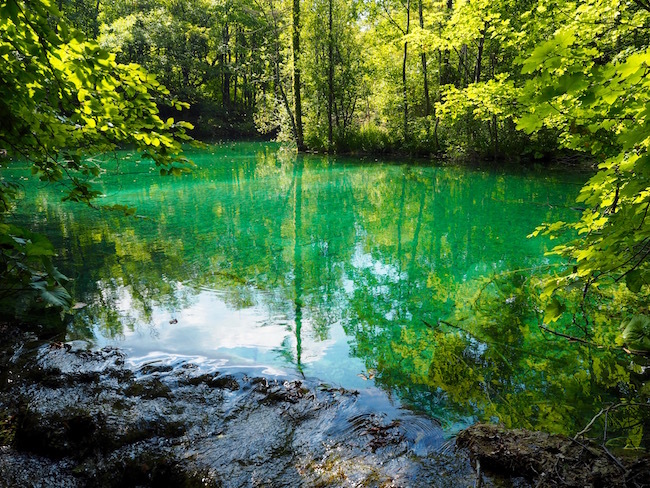 Both are worth exploring but sadly many people only visit the lower lakes. This means the upper lakes are generally a lot less crowded making them even more special! The luckiest ducks in the world! There are eight hikes inside the park. 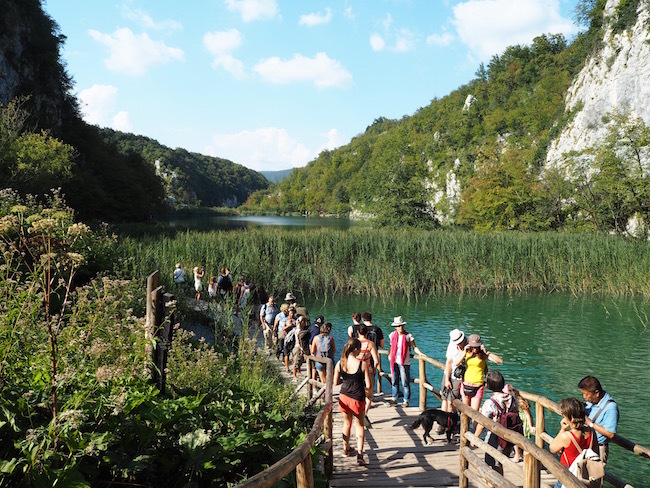 If like us you only have one day in the park then we suggest that you take hike H. This hike begins at entrance two where you take a panoramic electric bus ride to the top of the upper lakes. 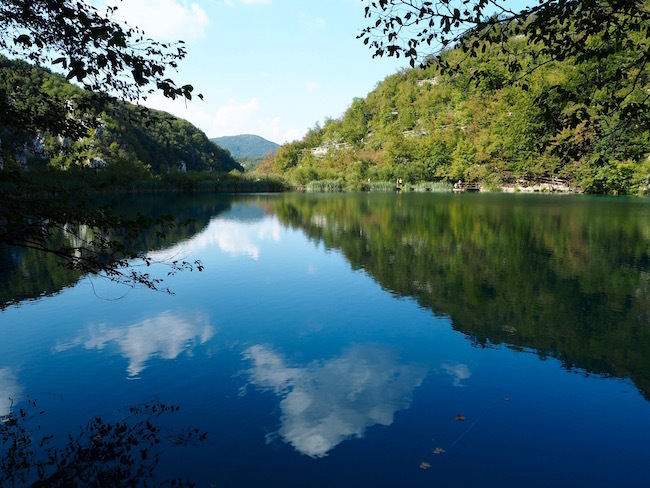 You then walk all the way down to Kozjak Lake and catch an electric boat across to the lower lakes area, before taking the path around the lower lakes all the way to the big waterfall. At the end of the lower lakes you will once again catch an electric bus back to entrance two. 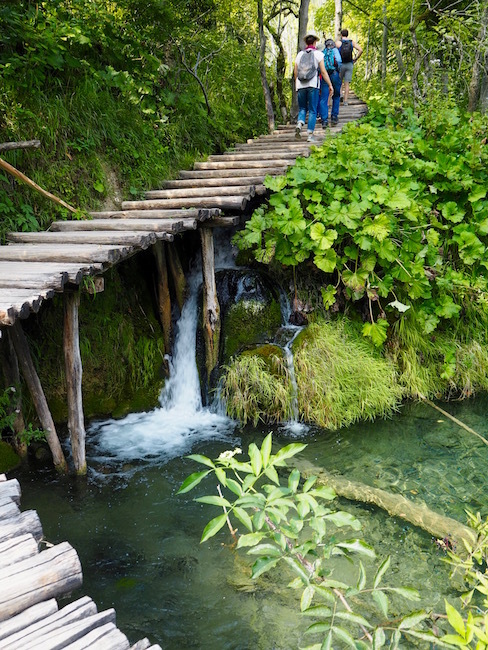 In total, this hike took us about six hours including stopping for lunch at one of the cafes located at the start of the lower lake area. 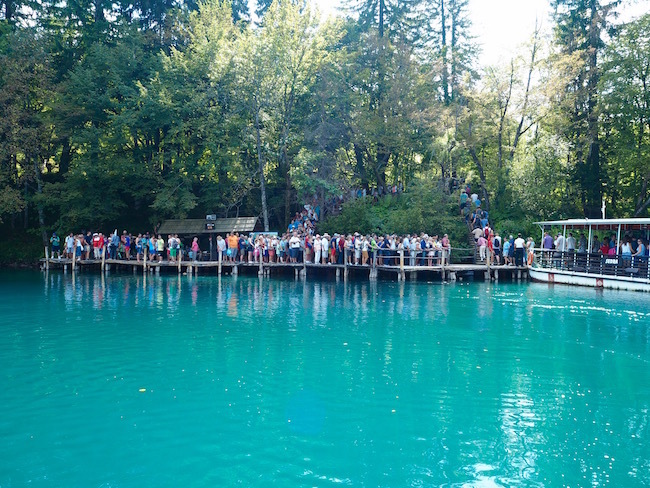 The crowd queuing for a boat! Avoid a visit between July and August as it is pick tourist season. It gets so crowded on the boardwalk that you may end up getting stuck behind many hoards of tourists. If you avoid this period you will also get a much cheaper ticket! Start early (before 9am) or if staying over for the night go later when the tourist buses have left. Try and stay overnight if you can, I wish we had! Bring your camera, and a spare battery as you will take many pictures! 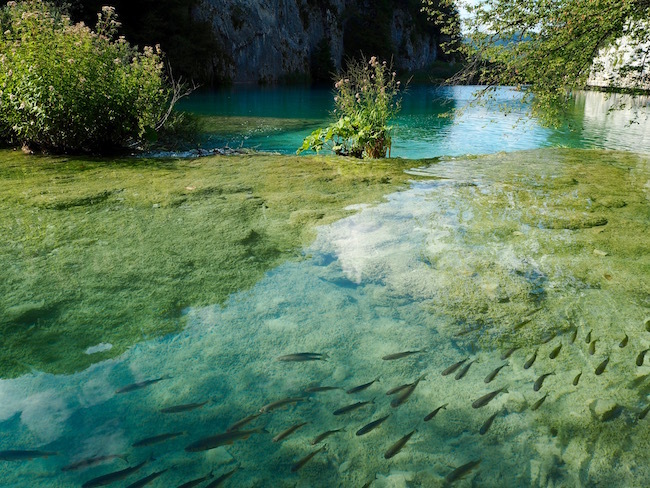 It is forbidden to swim in the Plitvice Lake National Park. Don’t be a stupid tourist; just DON’T SWIM! Yes, it’s inviting but it is inviting for a reason, because it is undisturbed! Don’t walk off the path! The area off the path is very delicate and stepping on it will damage it. Don’t we all want to leave this beautiful park the way we found it? Please, please, please take your rubbish with you. There is nothing that upsets me more than seeing litter left by tourists and especially in beautiful parts of the world like this. The world is not a dumpster! 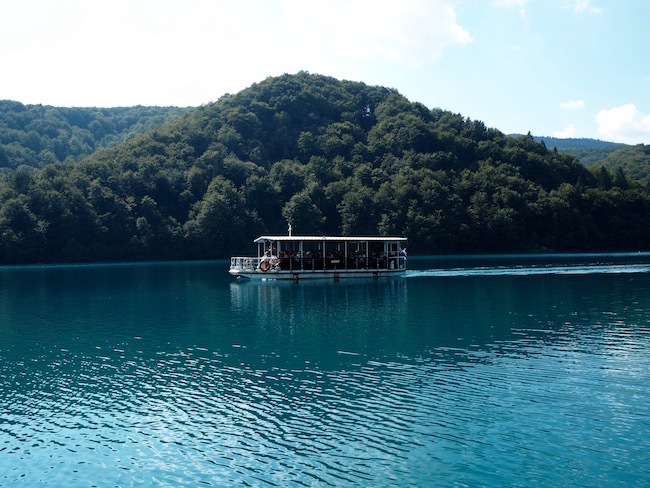 The price of the electric buses and boats are included in your entrance fee so you might as well make use of them; especially if you are short on time and don’t have time to walk from A to B. Although you can’t swim in the lakes, if you really want to get closer to the water you can hire a small row boat for 50 HRK per hour. Before you start, make sure you look at the park’s map to find where the toilets are. There are not many of them in the park so you will want to make a mental note of where they are! Bring a picnic lunch with you if you want to avoid the high cost of the park’s cafes. There aren’t many healthy food options in them either! 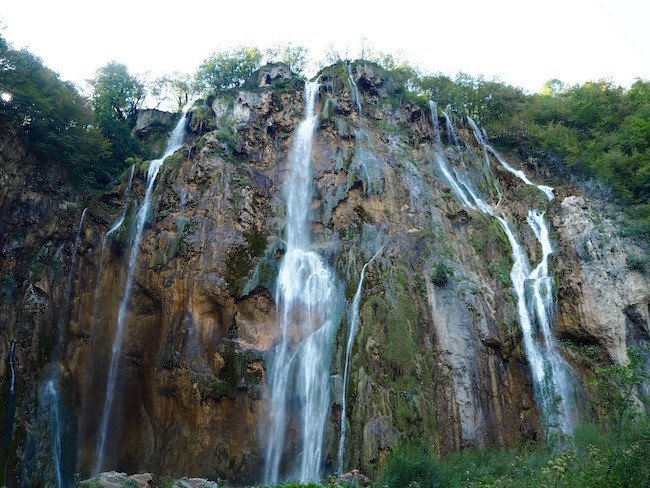 The Plitvice Lakes National Park’s big waterfall! 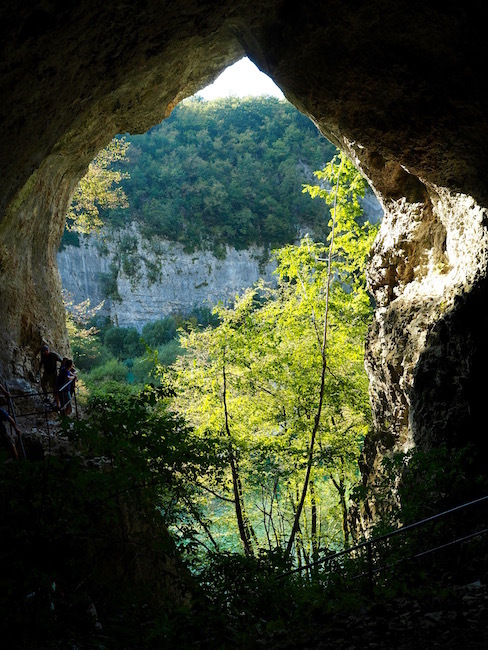 Depending on the time of the year you go the one-day entrance fee varies. If you drive to the park yourself the parking fee is 7 HRK. It is also possible to purchase a two-day tickets if you wish to stay overnight. So what do you think? It looks amazing, right? 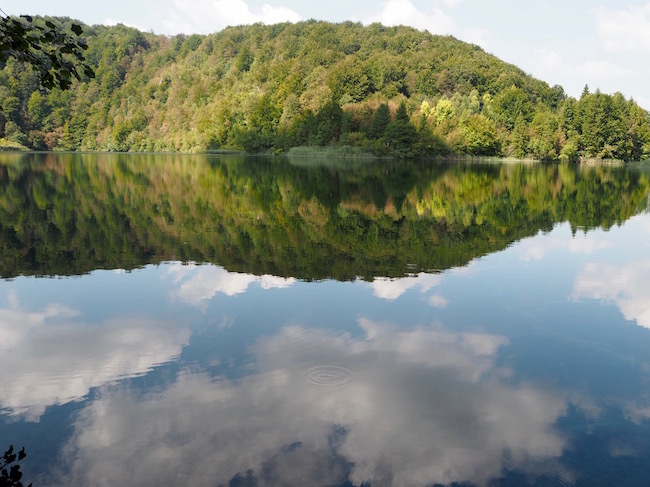 But the only way to find out just how beautiful these lakes are is to pay a visit yourself. Pictures are nice but they don’t really do them justice; they are a lot more amazing in person. So go and check them out for yourself and let us know what you think of them. If you enjoy this blog post, please share it with your friends!